Knife blocks are available in a wide array of materials. In addition to the standard countertop wooden knife block, you can use a drawer mounted or a magnetized strip to store your knives. These units protect your kitchen knives from dulling and damage caused by banging against other utensils. While your ideal choice will be dependent on your counter, wall, or drawer space, we love the Bellemain 100% Pure Bamboo in Drawer Knife Block. Most of us have plenty of drawer space going free, and with this model, you won’t need to worry about finding wall space or a spare few inches in your kitchen. It’s well designed and keeps your knives beautifully organized; tucked safely away. The knives are easy to store and retrieve, and your blades are well protected. 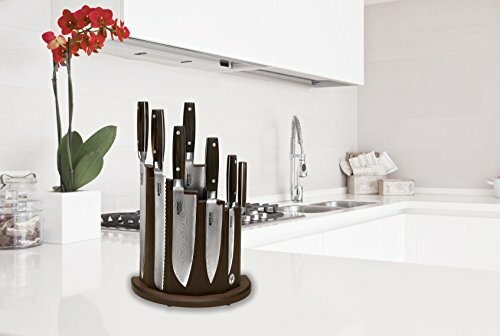 Why Get A Knife Block? 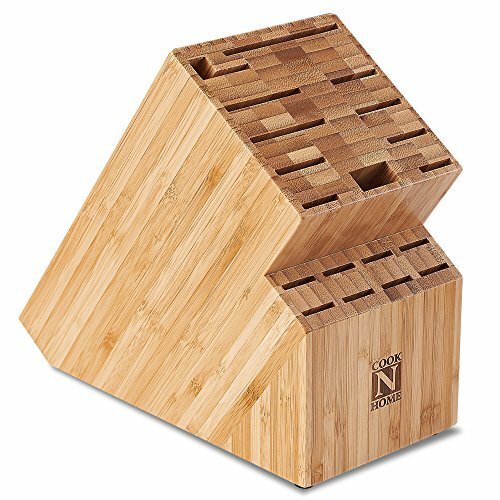 Knife blocks give you a variety of options for knife storage that will protect both you and your knives. Haphazardly storing knives in a drawer is less than ideal. It’s hard to find the blade you need, and while fumbling, you could get a nasty surprise from an unexpected blade. Correctly storing knives in a block will protect your knives from dings and dents caused by bumping against other knives, and keep them sharper for longer. Knives are made of steel of varying hardness. In addition, handles can be made of heavy plastic, wood, or stainless steel. Softer steel blades can be damaged by hard steel exposure, and bumps against handles can cause dull spots on the edge of your knife blades, resulting in awkward cuts and difficult handling. Having your most important utensils organized in a knife block helps you to be more efficient in the kitchen, and the right block can keep sharp blades away from little hands. A knife block can easily protect your knives from most damage. If you hand-wash your knives, simply wipe them dry with a towel and store the knife in its own slot. All styles work exceptionally well, keeping blades hygienic and sharp and at easy reach. The kind you choose depends on your space requirements, how many knives you have and which kind of knives. Drawer insert knife blocks are an ideal choice if you want to save on counter space. 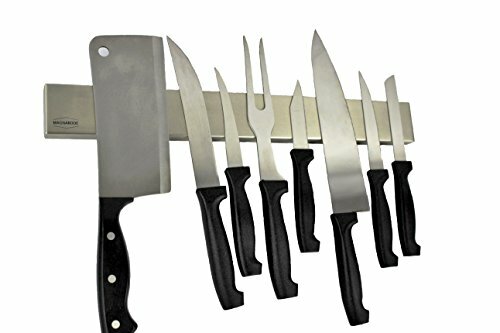 Your knives can stay protected from damage and tucked out of sight in a tidy wooden rack, sized to fit most kitchen drawers. Wooden knife blocks are available in a variety of stains and colors. Bamboo is a lightweight lumber product, built and glued into sandwiched layers of grain and stained for a striking look for your countertop. Be sure to select a knife block with stable rubber feet. You don’t want your knife block sliding around while you’re trying to put your knives away. Additionally, get a block with enough weight to stand upright when fully loaded. While a well-built knife should have enough blade material and length to balance out, wooden-handled knives can be quite heavy at the handle end. The Cook N Home Bamboo Knife Storage Unit fits an impressive 19 knives of all sizes and shapes, including space for a cleaver, scissors and sharpening steel. At five pounds, it’s nice and sturdy; combine that with the rubber feet and it won’t be sliding around your countertop. Be aware that the slots go right through from top to bottom, so if you mistakenly put a longer knife in the wrong block, the blade will emerge from underneath and could potentially cut you if you go to shift the block. Annoyingly, if you store scissors in the scissors slot, the handles cover up the slots on either side, making them impossible to use. Another niggle that might bother perfectionists is that not all the slots are perfectly aligned or exact, some have slightly different angles or widths. Overall, this is a generous knife block that looks attractive. It’s a good quality block that won’t break the bank and should hold the majority of your kitchen knives. Because bamboo can be compressed, it can also be curved. Modern knife blocks offer open blade storage and an architectural appeal in traditional wood tones. Hardwoods such as walnut, beech, acacia, and maple provide different tones and solid blocks of color. The wood grain on these knife blocks is particularly unique. Working with local artisans can give you the chance to purchase a one of a kind knife block. The Mantello XL Universal Bamboo Wood Knife Block doesn’t have slots. Instead, it features “flex rods” – resembling giant broom bristles when removed – which you insert the blade into at any angle you like. Because of this, there is a lot of versatility; you can easily slot in oddly shaped items such as honing rods or scissors. It’s great for those awkward-sized knives that you can’t fit into a traditional slotted block. Traditional blocks restrict you to certain sizes and configurations; if you have more than two chef’s knives, they may not fit. The Mantello can fit any combo of knives you desire. The downside of this method is that it’s hard to align your knives perfectly symmetrically if that’s something that’s important to you. It will, however, keep your knives safe and free from bacteria. The interior can safely be cleaned in the dishwasher. This XL model should be able to fit a large number of knives, yet the footprint is surprisingly compact and it takes up less space than the Cook N Home above. Magnetic blocks are often long strips of magnet inside a bracket built to be fastened to the wall. These magnetic strips suspend your knives where they can be quickly accessed. The Magnabode 16” Stainless Steel Magnetic Knife Strip is a great model because it features powerful magnets to hold even the heaviest knives. Installation is simple and fast. If you don’t want to drill holes in your wall, you can simply mount this on the side of your fridge. Strip storage options are fantastic for saving on counter space, so ideal for those cooks working in a smaller kitchen or even for use in an RV. With good airflow, you know your knives will stay clean, and there’s no fumbling around looking for the right one, as all are clearly displayed. When removing the knife from the strip, take care to roll the blade’s edge away from the strip to avoid dulling it over time. Another magnetic option for knife storage is the drop-down tray, which fastens to the underside of an upper cabinet. Lower the tray and your knives are neatly laid out and held in place by powerful magnets. These units are generally built with extremely stiff hinges and held in place by friction, but some have catches that must be fastened to keep the tray elevated. You’ll need to review your cabinet configuration to make sure you purchase and can easily install the best unit for your home. Floating knife blocks offer tremendous visual appeal for a few select knives. These panels are free-standing units in a variety of materials with a powerful magnetic insert inside the knife block. The Boker Wood Magnetic Knife Block displays your knives beautifully. There are seven dark wooden panels, each with internal magnets. This model can store seven knives in total, with the center panel big enough for larger knives. It’s super easy to keep clean – simply wipe down the surfaces. Because all your knives are clearly visible, you won’t accidentally choose the wrong one as you might with a traditional block that hides the blades. One thing to note with this style of knife block is that you have to learn the right technique for removing a knife. If you simply pull, the whole device will tip over due to the strong magnets. You’ll need to gently twist the knife as if you are peeling the blade away from the wood. Although it’s nice and compact, you are truly limited to seven knives; because the magnets are centrally located in each block, you can’t store two smaller knives on one. This block is ideal for someone with a few quality kitchen knives that wants to proudly display them in a compact and attractive way. Cooks who prefer a more modern look will enjoy a clear knife block. These units feature a rack on the top for handles to rest on and a clear box on the bottom for displaying the blades. These units can also feature clear panels held together with visible metal fasteners for a striking visual effect. If you’re a fan of a more whimsical decor, you can even purchase animal-themed knife blocks. These units are often ceramic and have a durable plastic knife block inserted within the decorative ceramic piece. 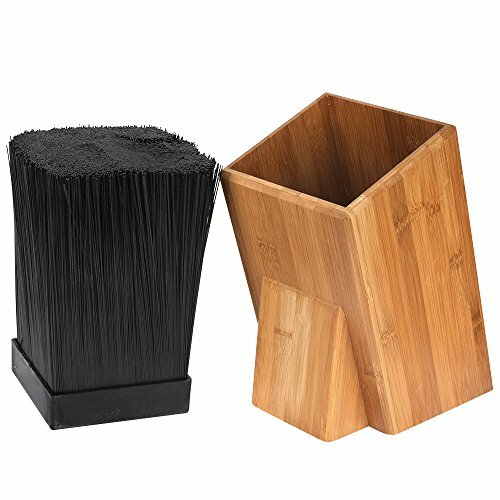 The Bellemain 100% Pure Bamboo in Drawer Knife Block is a beautifully designed unit. It is designed to fit any standard kitchen drawer and can store 16 knives of varying sizes. Save your precious counter space for more important items. 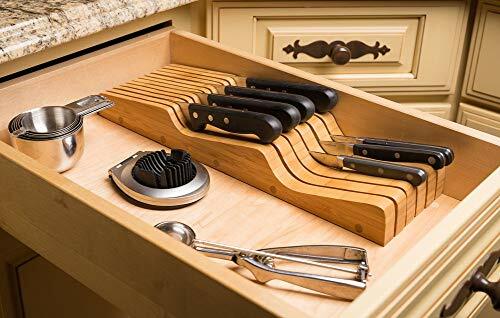 In-drawer knife holders are ideal for homes with small children. Many of the other featured blocks may be accessible to curious, inventive toddlers, but if you pop your knives safely away in a drawer with a childproof lock, there’s no way accidents can happen. Select a knife block to suit your decor. If counter space real estate is precious, a drop down magnetized panel or in-drawer unit may be your best bet. 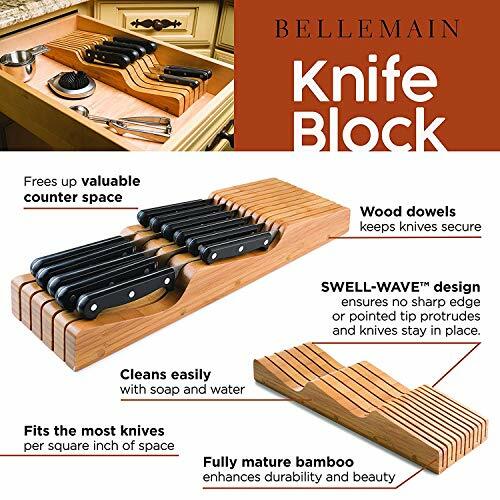 The Bellemain 100% Pure Bamboo in Drawer Knife Block should fit even the most compact kitchen without compromising on precious counter real estate, with the bonus of being tucked safely away out of the reach of small children. Whatever you do, don’t leave your knives to bump around together in a drawer; you’ll lose cutting power because of dings and risk cutting yourself because you have to force the knife, or you’ll spend a lot of time sharpening your knives.